The easiest way to reach Murcia is landing at the Alicante airport (ALC) and take the bus to Murcia (55 minutes). 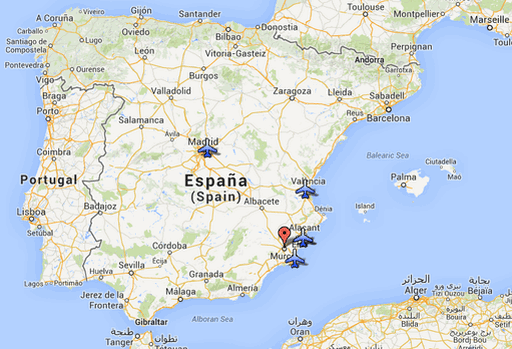 However you can also reach Murcia from Madrid-Barajas (MAD), Valencia (VLC) and Murcia-San Javier (MJV) airports. Other option it is to take a flight to Madrid-Barajas or Barcelona-El Prat, which have regular flight connections to Alicante. View Airports in a larger map. ALC is an international airport and the best choice to come to Murcia. From the arrivals floor, you will have to move upstairs to the departures floor and then go outside. Once you are outside, you will find the Bus stop on the right. Look for the 'ALSA' sign To Murcia. You can buy the ticket on the bus or from the sales clerk who is sometimes near the bus stop (Bus stop location). The following is an estimated timetable. Please check Alsa web page. Madrid-Barajas is the biggest airport in Spain. If you land at Madrid-Barajas you can reach Murcia by train or bus. Train is probably the easiest, fastest and comfortable way to reach Murcia. Madrid-Barajas is directly connected to Chamartin-Renfe train station by Underground. Metro line 8 runs from all the airport terminals to Nuevos Ministerios station in central Madrid (Line 8 map). Once you are in Chamartin-Renfe train station you can buy a train ticket to Murcia-El Carmen train station. You can also buy the train tickets online. MJV is a small local airport. 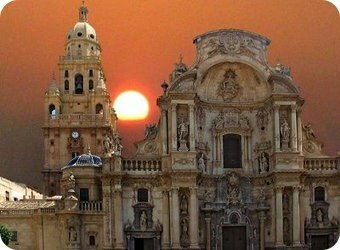 From Santiago de la Ribera you can get a regular bus to Murcia (LAT company) (Santiago-Murcia Bus Link). NOTE: If you prefer a prívate transfer service or rent a car, please, contact to the Technical Secretariat to provide.